CEOs from AuthenTec and Cogent Systems have joined the board of directors of the International Biometric Industry Association, expanding the board to 10 industry leaders and reflecting the trade organization’s growth in consumer, commerical and government markets. Washington–The International Biometric Industry Association (IBIA) – the biometric industry’s leading trade organization – today named AuthenTec CEO F. Scott Moody, and Ming Hsieh, CEO of Cogent Systems, to the association’s Board of Directors. The announcement expands the IBIA’s board to 10 industry leaders, and reflects the non-profit trade organization’s goal to represent the entire fast growing biometrics industry – including the consumer, commercial and government markets. Mr. Moody has served as AuthenTec’s president and CEO since co-founding the company in 1998. Since that time, Mr. Moody has been responsible for its overall strategic direction, fund raising, business development and the management of day-to-day operations. He led the company from a startup to become the world leader in biometric fingerprint security, innovation and sales for the PC, wireless and access control markets. The company’s sensors are now used in more than 8 million devices worldwide. Mr. Hsieh has served as CEO, president and chairman of the Board of Directors since founding Cogent in 1990. He is responsible for the company’s executive management, including long-range planning and corporate growth, as well as developing and implementing company policies, procedures and philosophies. 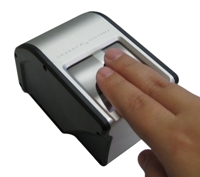 Cogent is a leading provider of Automated Fingerprint Identification Systems, or AFIS, and other fingerprint biometric solutions to governments, law enforcement agencies and other organizations worldwide. Founded in 1998, the International Biometrics Industry Association (IBIA) is a non-profit trade association, and the biometric industry’s leading voice on key policy issues. Association members represent the leading providers of biometrics products, systems and services for the consumer, commercial and government markets. Headquartered in Washington, DC, IBIA impartially represents all biometric technologies used for automated human recognition – including face, fingerprint, hand, iris, vascular, speech, dermis/skin as well as DNA. For more information, visit www.ibia.org.